The hotel is in a short distance from the airport, the location is near of 3 metro station. There are many shops and restaurants in the mall or the neighborhood. The hotel itself is excellent, I booked a one bedroom apartment, it is very spacious even more than I expected, and it is suitable for families. The apartment has a kitchen that equipped with everything you need. It has a big setting area and a lovely terrace. All staff is friendly, professional and helpful. There are two swimming pools and many good facilities. I would like early checking and late mostly 8pm since my flights to USA leave after midnights. Everything, the place, ambience and the staff. I have a visitor who would like to come for a dinner and they allowed it. They treated and assist us properly. It was a perfect staycation. The staff are nice and helpful. Ill be back again. 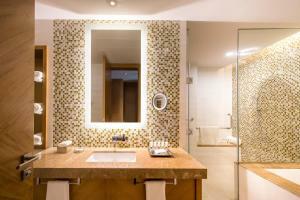 Cleanliness, staff, location, everything was perfect at Swissôtel. I would definitely go back if I ever travel to Dubai again. Really friendly & courteous staff Good buffet breakfast Really clean apartment Linked to the mall Centrally located out of Deira All in all a wonderful place to stay at. Love everything! Excellent! We had a great time! Spent our magical event (wedding) here! Staff our nice esp. Floraida & the banquette manager ! High five!!! I like the location. It opens to the mall. There’s Carrefour, Starbucks, etc. Very convenient location. Spacious and clean apartment with direct access to the mall. 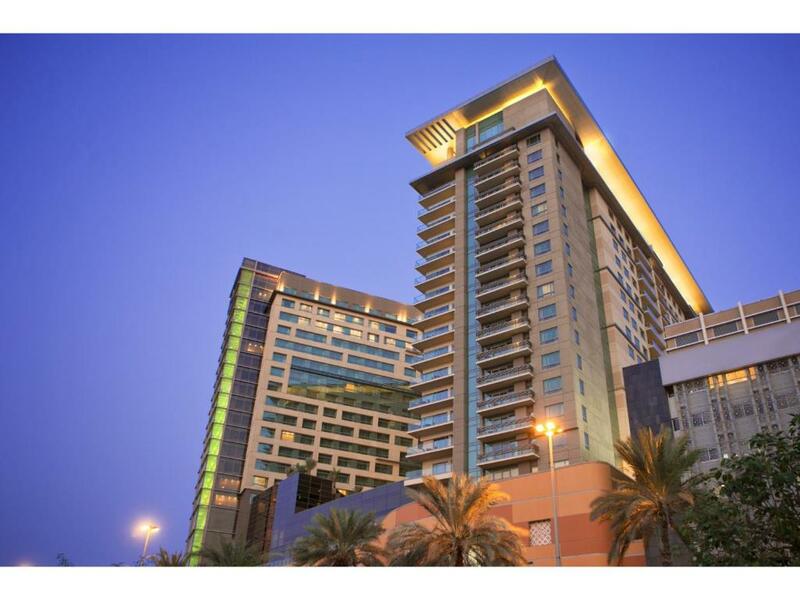 Lock in a great price for Swissôtel Living Al Ghurair – rated 8.7 by recent guests! It offers 192 home apartments that include well-designed one, two and three bedrooms. Each room has a private balcony with views of Dubai, a beautiful complex gardens and swimming pools. A fully equipped kitchen with a fridge, glass-ceramic cooktop panel, oven (in three-bedrooms only), microwave and dish washer makes a comfortable living for both long & short-stay guests. The best choice for a family oriented hotel apartment destination in Dubai. It is linked to Al Ghurair Center, a shopping destination with a wide range of restaurants featuring various cuisines. A shuttle service is available to experience the finest beaches in the city. In this area you can shop 'til you drop for popular brands like Nike. 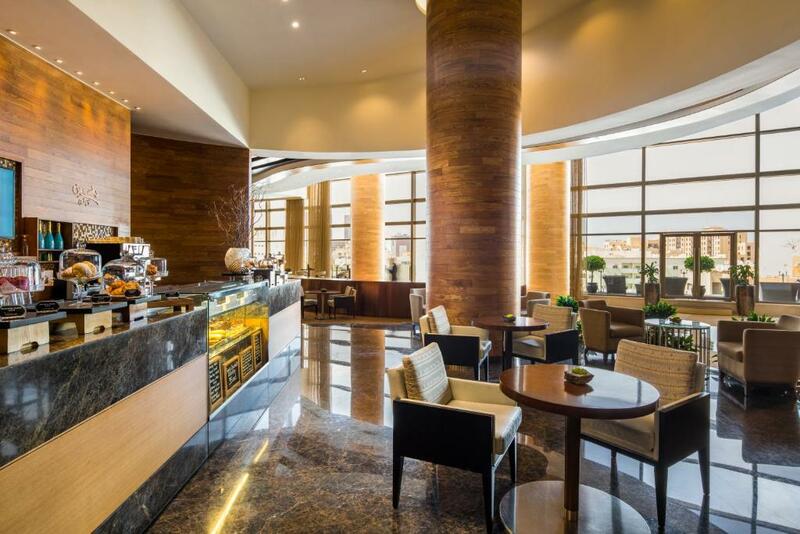 When would you like to stay at Swissôtel Living Al Ghurair? A 148 sqm two bedroom suite perfect for families. A king size bed with a separate twin bedroom, living room with a dining table, a fully equipped kitchenette, writing desk, 3 bathrooms with 2 bathtubs, a balcony with 2 chairs and coffee table. This elegant 112 sqm. suite features a king size bedroom, separate living room with a dining table for 4, working desk with 2 chairs, a balcony, 2 chairs and coffee table ensuring that each stay is always a pleasurable one. This 189 sqm. three bedroom suite has two masters king bedrooms and one twin bed room, a separate living room with a dining table for 8. Spacious balcony with 2 chairs and a coffee table to this complete suite experience. Let Swissôtel Living Al Ghurair be your home when staying in Dubai. This deluxe hotel apartment offers guests superior comfort, security, safety and warm hospitality through its 192 stunning home apartment that include well-designed one, two and three bedrooms. 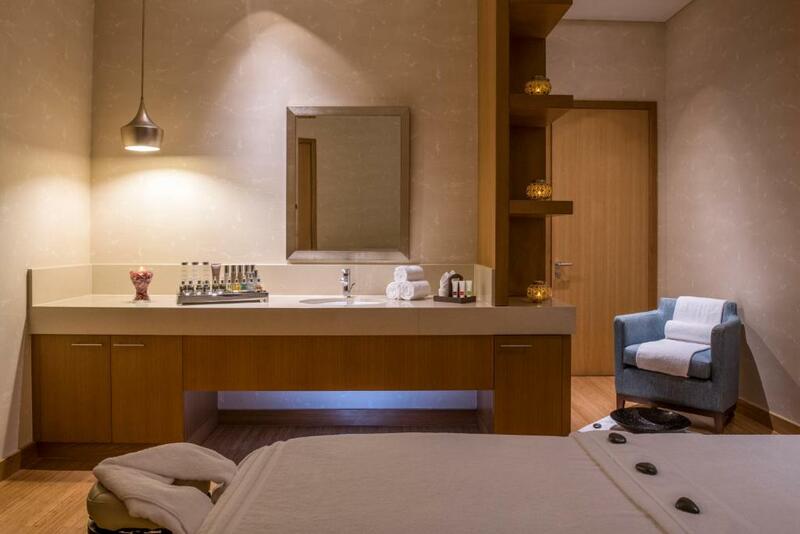 The spacious rooms are decorated with elegance and style. 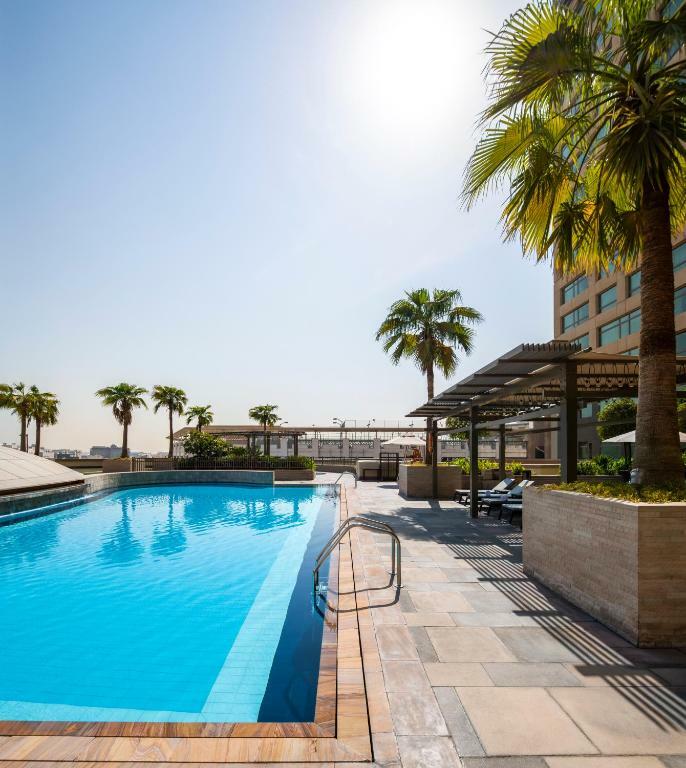 Each has a private balcony with outdoor furniture with views of either, Dubai Creek, Garden, City views and a beautifully maintained complex gardens and swimming pools. A fully equipped kitchen with ample counter space along with a fridge, oven, microwave, and dish washer makes a comfortable living for both long and short-stay guests. 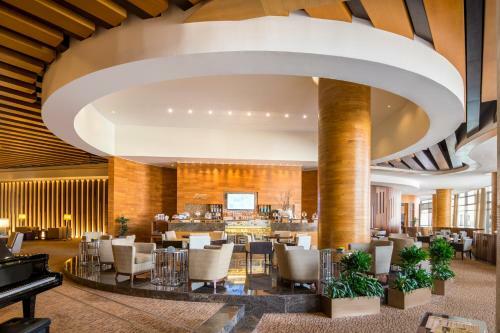 The hotel is made up of 484 talented and hardworking colleagues coming from more than 40 countries all over the world. Their aim is to provide “Treasured Time” experience to the guests. World-class genuine Swiss Hospitality is their commitment to everyone visiting the properties. The main aim of the hotel is to pursue the development of the colleagues by offering extensive training that is related to his department and need. The hotel believes that they are the main asset and their happiness is their core achievement. Whether you’re a tourist or travelling on business, Swissôtel Living Al Ghurair is a great choice when staying in Dubai. Linked to Al Ghurair Centre, a top shopping destination featuring the top brands with more than 280 stores and home to a wide range of restaurants featuring multi cultural cuisines, this 5 star hotel is the perfect place to enjoy some of the city’s attractions such us the Gold Souk, Spice Souk , Dubai Heritage Village and Dubai Creek. 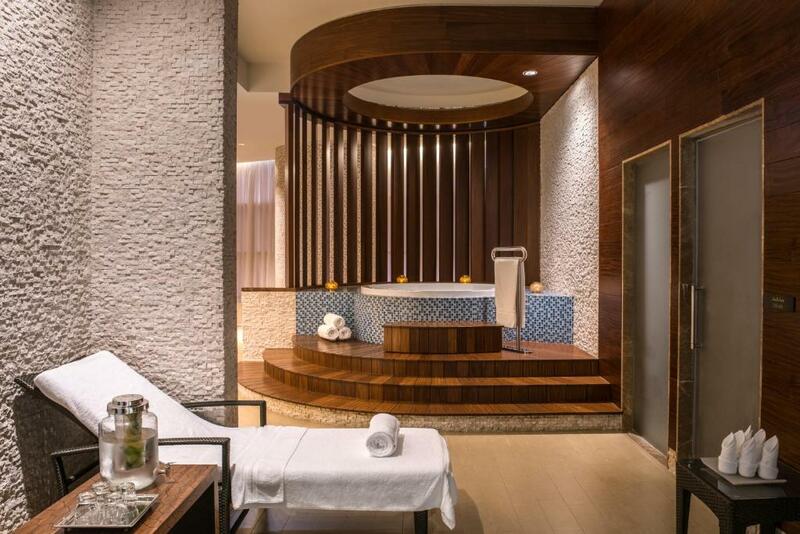 Nestled in the heart of Dubai, it is well connected to all the city’s business and top tourist destinations through the Dubai Metro rail network. It is a walking distance from the Union Metro station (central hub to all metro stations). It is 4 metro stations away from the Dubai International Airport Terminal 1, 3 metro stations away from Dubai World Trade Centre, and 3 metro stations from the Health Care City. House Rules Swissôtel Living Al Ghurair takes special requests – add in the next step! Swissôtel Living Al Ghurair accepts these cards and reserves the right to temporarily hold an amount prior to arrival. Please note that original credit card used to make this booking must be presented at the time of check-in. Failure to do so will result in a separate payment for the entire stay. Any amount authorized on the original credit card will be released by the hotel within 14 working days. You can reach anything you want from here easily, without being a "hostage" in a tourist trap environment. We repeatedly requested for a higher floor which was not given to us. We reached the hotel at 4pm, but still had to wait for 1 hour to get our room. I don't know why even after repeated requests for a higher floor with a good view, we were given a pool view room, with very little to look around, even though we were made to wait. We loved the location, the cleanliness, the crisp equipment in the our apartment, etc. The breakfast was awesome, each day. The location of this property is simply superb. I love everything about this hotel,especially the size of the rooms,the breakfast the ever smiling staffs,and the connecting mall makes shopping at your door step. Prime location, direct access to Al Ghurair mall, easy taxi access from the lobby. Clean well equipped apartments, decent pool. The check in process was horrible, we checked in at 4 PM , they told us there were no apartment available and they didn't give us a specific time for waiting we ended up getting the apartment after spending more than one hour in the lobby and visiting the reception many times. The apartment side had serious issues in management, we requested an extra pillow and a blanket we had to call 3 times and waited for 2 hours and we ended up getting only the blanket while the pillow never arrived until we checked out. Location, apartment was clean and spacious, parking service. Cleaners need to be more efficient.. Better lighting in the lounge area, as well as the 2nd bedroom. The main bedroom had sufficient lighting. Centrally located, conveniently adjacent to Al Ghurair Center which has most of the high street stores and Carrefour too. Spacious, beautifully appointed apartments including a small laundry room with a washer/dryer (so convenient when traveling with younger kids). It was like a home away from home. Loved the gym and pool facilities. Every single staff member was friendly and helpful- from the porters, to the car valet staff and the lifeguards. Temi & Shai in Reception welcomes guests beautifully each day with complimentary Kahwa & dates.